Tomas Harker revisits stories of the past. 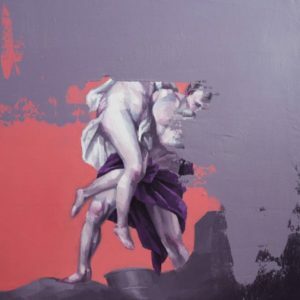 An emerging artist based in the UK, Tomas recontextualizes imagery culled from classical paintings and found photographs, obscuring or altering parts of the original works to create a new, uncanny experience. 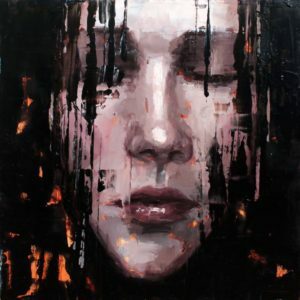 Tomas’ figurative paintings are inspired by a longer historical practice of reappropriating art from previous periods. 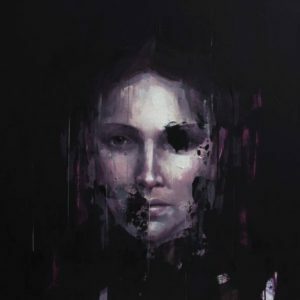 Artists in classical Greece and during the Enlightenment did the same, but Tomas is interested in the now even wider divide between these past movements and our present, revisiting traditional narratives through a more contemporary lens. 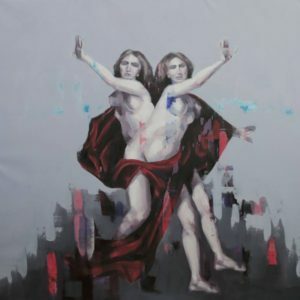 Tomas has exhibited his paintings across the UK, including in an exhibition at the Tate Modern, Flux Exhibition at the Royal College of Art, and the Soho Revue Gallery in London. 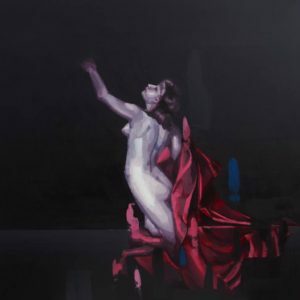 Tomas was named a semi-finalist in Saatchi Art’s 2014 The Body Electric Showdown competition. His works have also been featured in numerous publications, including British Vogue. I often use historical photographs, paintings, or just found images from photographers who interest me as a source. There are some re-occurring themes in my work, in particular with my latest work that focuses on a particular period in the history of art, re-appropriating the past from a contemporary perspective. The ideas first developed in classical Greece and re-emerged during the enlightenment period in Western Europe, and are still as fundamental to our lives today as they were then, but the breadth of the divide between the past and present is so vast that many of the ideas seem irrelevant or obsolete. It is between this divide that my latest work explores. Elements of the original painting are hidden or altered, changing the meaning or feeling of the original work. This is done not with the intention of arriving at a specific destination; rather the work is successful once it becomes a visual trigger to evoke a subtle feeling or narrative. This way of working is reminiscent of the expressionist painters. Consequentially the image becomes unclear or uncanny. The ambiguity forces individual interpretation of the meaning and the reconsideration of classical themes. The best advice I’ve been given was by the graphic designer Jonathan Barnbrook. He said that you should take the courage to stand by what you want to make, as in the end it’s better to feel satisfied doing something you believe in rather than being maybe more secure in your work but unhappy. Although this sounds obvious, it’s easy to get caught up in things. Also I think on a similar note, the painter Alex Kanevsky says that artists who are trying to be original, by definition cannot themselves be original. This helped me, while still borrowing from many artists, to explore directions that I find interesting and exciting. I like to work with music most of the time, but silence when things are not going well. I used to listen to the same albums over and over again, which was getting monotonous until I started using Spotify. Now there is so much choice. It would be Persian Miniature by Adrian Ghenie. This is without a doubt one of my favorite art works, by someone who I am inspired by daily. I started reading more this year after being told by the artist Benjamin Murphy that he managed to read 70 books last year. I tend to read older writers and a lot of art theory books. One of my favorite fictional authors is Joseph Heller, Catch 22 being one of my all time favorites. Homer’s Odyssey was useful thematically for new paintings. At the moment, I’ve been reading a lot of Albert Camus. Also my guilty pleasure is Steven King.